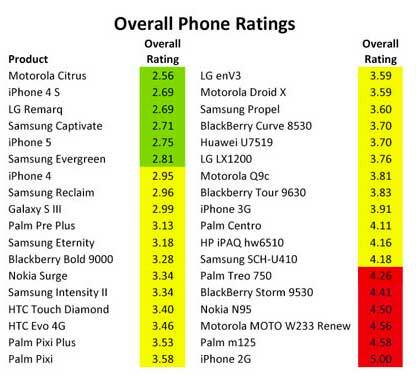 Toxicology ratings of smartphones – how toxic is your phone? Here is a quality piece from iFixit that performs a chemical analysis on 36 smartphones. Which ones are the cleanest? Posted on October 11, 2012 Author robotchampionCategories defaultTags chemical, clean, dirty, ifixit, phone, ratings, smartphone, toxicLeave a comment on Toxicology ratings of smartphones – how toxic is your phone? Have you seen a wooden surfboard in the water yet? If not, you will soon as these earth-friendly boards grow in popularity. According to Wegener, this historical Hawaiian surfcraft – which appears to be little more than a flat piece of wood in the shape of an ironing board – may not only be the most enviro friendly surfboard available today, it might be part of one of surfing’s next big leaps in modern board design. It is also a much-needed design, since the foam boards of today are nearly as toxic as you can make something. The recent movie, ‘Manufacturing Stoke’, discusses this strange development, as well as a detailed post I wrote on Green Surfboards. The next step is finding the right type of wood that can match the ultra-high performance of the industrial-era poly/resin/chemical boards used by professional surfers today. Phil Joske introduced him (Tom) to a sustainable board building material called Paulownia wood. With a much greater strength-to-weight ratio than balsa, an easy-to-work-with nature, and an imperviousness to saltwater, Tom used this unique wood and his innovative longboard designs to help revolutionize the genre of hollow wood surfboards. Many in the industry are taking note of these designs, there is a certain beauty to a glossy wooden board. Especially, knowing that it is handcrafted and great for the environment. Learn more at Patagonia’s – Wood is Good series (featuring videos, interviews, and lots of links to surf films and designers). Fishermen were casting their lines into the urban waters of Washington, D.C., into a river notorious as one of the dirtiest in the nation. What’s more, according to a recent study, they represented a small fraction of the 17,000 or more residents of this metropolitan area who are consuming fish from a river that has all the markings of a Superfund site. Sometimes you just can’t believe it, the article even says that a sewer line directly dumps a billion gallons of human waste every year. Yeah, the river really needs help. From the first board-shaping school. The art of hand-shaping surfboards is being threatened by machines. Shaper Studios is changing that. The Mission Valley shaping school is allowing everyday surfers the chance to glass and paint what they ride. We drop in on owner Chris Clark, who says the studio is luring everyone from pros to groms to surf companies and bands like Foster the People. “It’s impossible to compare surfboard shaping to anything else,” says Clark, an SDSU MBA grad student and entrepreneur who is creating a unique blend of retail and DIY manufacturing at Shaper Studios. But what about people who are power-tool-phobic? We are with you the whole time. We just taught a 12-year-old girl to use a planer (a power tool with sharp blades). So it’s not just a bro-fest? No way! We just did a series with French pro Margaux Arramon-Tucoo. We entered a film of her shaping at a local film fest. Surfboards are some of the most toxic toys. We use Marko recyclable EPS foam. We also use epoxy resins, which are odorless and have zero VOCs. It doesn’t smell in here so you can even glass your board without wearinga mask. Down the street on Magnolia, just a few blocks form the beach, is the ASCON Landfill Site. 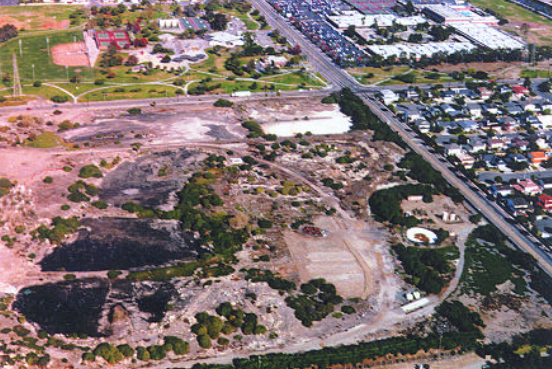 This 38-acre parcel of land is a toxic waste dump containing waste from construction and oil drilling. 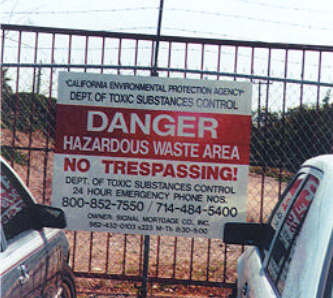 It is considered a California Superfund site, meaning that it is one of the most toxic in the state. According to the California EPA, the area “operated as a landfill from 1938 through 1984…in its early years came from oil drilling operations, including waste drilling muds, waste water brines, and other drilling wastes. 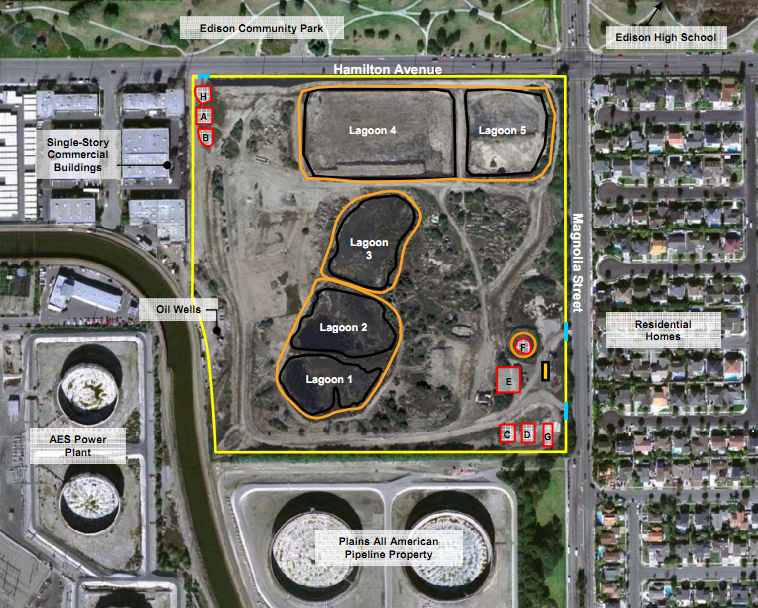 Orange indicates 25-foot sludge lagoons. Red squares indicate buried pits. This news has to be shocking for anyone living in Huntington Beach. 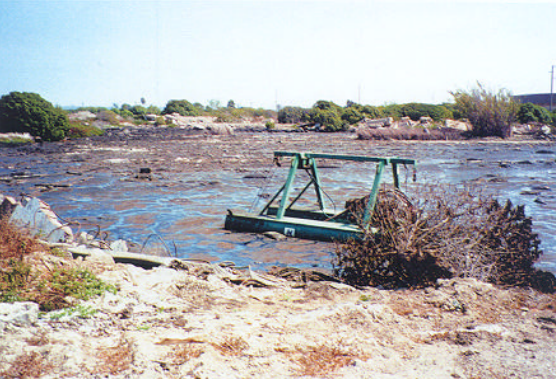 Lagoons of sludge 25-feet deep, drilling wastes, pits of slag/acid/oils/sytrene, and then covered over with more waste. Consider that across the street is Edison High School where thousands of kids, teachers, and parents spend their days, and on the other sides are houses and a popular park, Edison Community Park (another former landfill with methane gas leaks). Main entrance off Hamilton St. The news doesn’t get better. An investigative report from the OC Weekly in 2004 discusses four children from the area who contracted a rare form of brain cancer. Since then the city and the contractors have been testing the groundwater, stormwater, air quality, etc, and in March 2011, the project was considered complete. What happens next is unknown. The government agency responsible for the clean-up will continue its slow progress. Further tests, including investigating the lower levels of Lagoons 1, 2 will be conducted. Then planning, public hearings, and finally another clean-up. With so much waste on-site this will take decades. At some point, the land will be clean enough for a private company to complete the process. The land is in such a valuable location that many developers will gladly take on the last steps of cleaning to reap the profits. In the meantime, we all are stuck with a remnant of our industrial past. For updates, visit the community website for the ASCON Landfill. The best surfboards in the world are the most toxic. Take any professional surfer and she/he will be riding a high tech stick packed with the latest innovations. It will also be the worst possible board for the environment not only in its materials, but in the creation, disposal, and in effects on workers creating the boards. The good news is that many small business are developing alternatives. UK-based company, Ocean Green, is bringing back the all wood board by hollowing out a Balsa-wood plank and using bio-degradable fiberglass cloth. Country Feeling, a Hawaii based shaping group co-founded by Jack Johnson, is developing a soy and sugar-based foam and a solar cured resin. There is also a movement to recycle everything from the foam dust to the actual boards themselves. Green Foam collects the excess dust tossed out in shaping shacks to make new foam for boards. No other sport is so intrinsically linked to nature. Some call it a spiritual experience, most call it indescribable. And yet, in becoming the multi-billion dollar industry it is today, a great paradox has risen. Surfers are indeed directly connected to the earth’s pulse and yet a majority of the materials used are environmentally toxic. Still, this whole story largely unknown. Only a few of the large companies are taking it seriously which means even fewer surfers are interested. 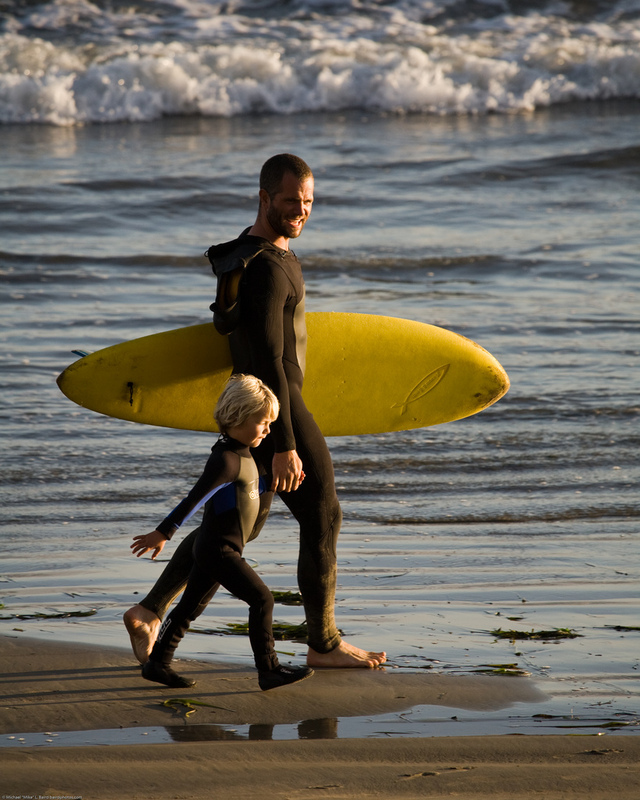 Surf wax and wetsuits also have their own toxic problems and are in need of an overhaul. Which means its all about grass roots growth. Tell your friends, experiment in your garage, and spend your dollars on what you care about. We’ve all seen the classic image of a shaper wearing the breathing mask. Heard the tale of the young protégé shaper sweeping up foam dust. But, have you ever thought about why the mask is needed, can you think of any other profession where people need them? Toluene Diisocynate, Polystrene, Polyurethane, Chromium, Dicarboxylic Acids, and Dihydroxy Alcohols. An explanation of how we got here starts back in the 60’s with the massive 10-foot long wood planks. They were heavy, so heavy that you had to balance it on your head and cart it around in “woody” wagons. These boards defined the early era of surfing and the longboard riding style (slow, long curves at special breaks). Then modern technology stepped in: foam, fiberglass, and resin. The wood was whittled down to a thin strip in the center for strength (stringer) and the rest was taken up by foam, then shined up with fiberglass in resin. The result was a lighter, faster, and more agile board. It revolutionized the sport. Made it the worldwide industry it is today. Then it all came crashing down in 2005. A series of factors contributed to this change, the largest of which was the shutting down of Clark Foam. This giant supplier of foam for boards worldwide came under the cross hairs of government (all of them). The city, county, state, and federal authorities wanted a cleaner factory and Gordon Clark couldn’t take it. The story is still unclear, whether Gordon refused to clean-up or the city simply wanted him gone. It is probably somewhere in the middle but the lawsuits, criminal charges, and cancer-riddled workers speak to some truths. 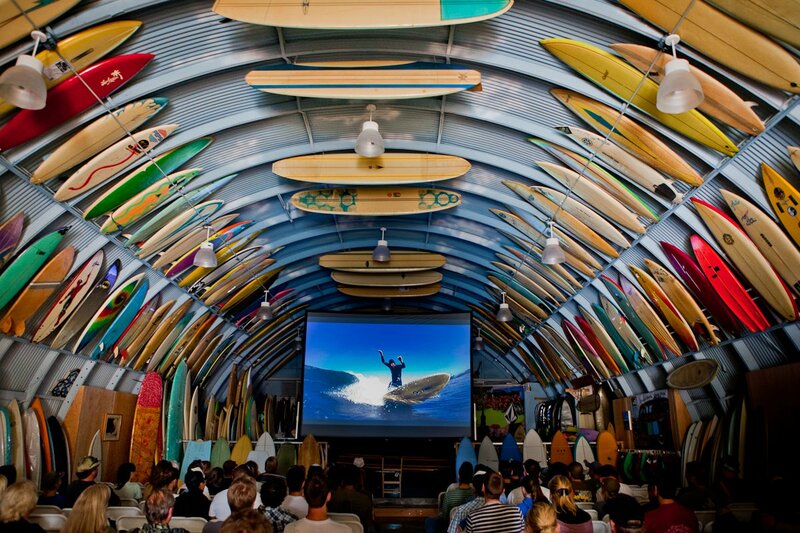 Namely, the growth of the surfboard industry is creating a lot of waste and pollution. As the government stepped in it found that nearly every element of the modern surfboard involved toxic chemicals or volatile organic compound. The regulators clamped down and the surfboards manufacturers went abroad or went mechanical. Hoping to outsource the pollution or remove the worker from the shaping. Clearly the industry didn’t want to face it’s own problems. Which now puts the industry on the verge of a new breakthrough. A revolution in materials to bring about a cleaner, safer way to enjoy the sport we love.